When folks talk about wishing to see animals in the wild, they tend to refer to going on animal safaris in the various wildlife parks of Africa. Most people are however; unaware that Malaysia with its various diverse habitats can offer an equally interesting wildlife-spotting experience. Malaysia hosts many national parks and nature reserves like Taman Negara, the Endau-Rompin national park, the Mount Kinabalu National Park, the Krau Wildlife Reserve, all expansive green lungs, which welcome visitors and offer opportunities for viewing Malaysia’s many exotic native creatures, many of which are not found elsewhere in the world. It is estimated that Malaysia’s fauna repository currently consists of 210 species of mammals, more than 600 species of birds and over 200 species of reptiles. 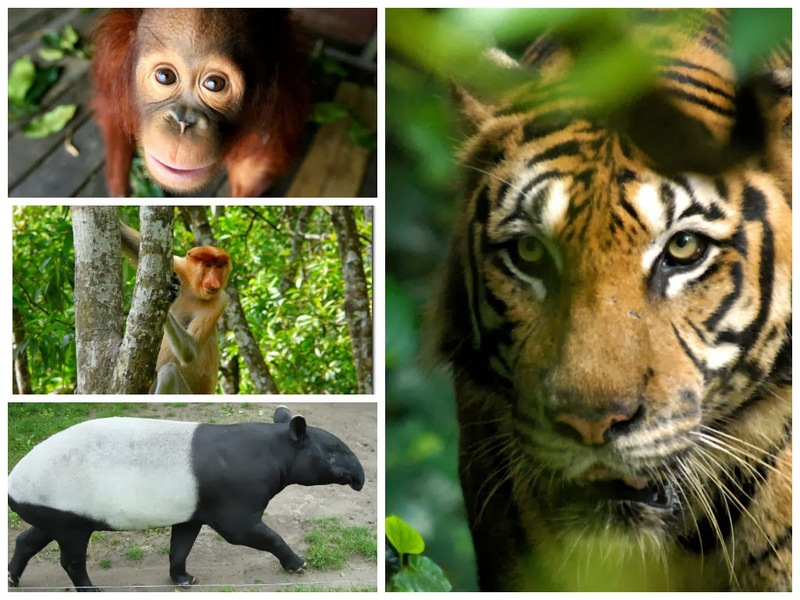 Malayan tigers, Malayan tapirs, Malayan sun bears, tapirs, orangutans, proboscis monkeys, Bornean pygmy elephants, Sumatran rhinoceros, bearded pigs are just a few of the exotic creatures known to reside in the forests of Malaysia. The Malayan tiger is venerated as a symbol of valor and strength, however like its siblings in other parts of Asia, it too faces the threat of extinction. Malaysia’s famed national parks like the Taman Negara, the Krau Wildlife Reserve, the Endau Rompin National Park and the Royal Belum State Park offer rare and occasional sightings of this magnificent beast. The comical Proboscis monkey is endemic to Borneo. While the females of the species, are relatively normal-looking, the males evoke much laughter with their rather funny appearance, for they sport big, dangling noses in addition to potbellies and flattop thatches of hair. The privately owned Labuk Bay Proboscis Monkey Sanctuary, near Kota Kinabalu is the best spot for a sighting of this strange creature. Orangutans are adored the world over. This fuzzy, red-haired primate can be sighted at Malaysian conservation centers like the Sepilok Orang Utan Rehabilitation Centre in Sabah and Pulau Orang Utan near the Bukit Merah resort in Perak or then in the wild at the Kinabatangan Wildlife Sanctuary or the Danum Valley Conservation Area.